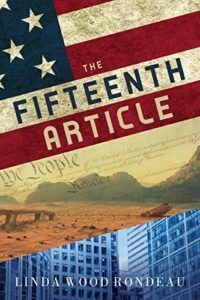 The Fifteenth Article by Linda Wood Rondeau presents a book with an inventive Christian dystopian future. It has a clear development of an evil godless government with a strongly persecuted believer minority. The characters are intriguing, though I can’t use compelling. The reason, I suspect, reveals itself in the basic stance of the story as a romance as opposed to a dystopian thriller. With a quick run in my head, I count five romances and I believe I am forgetting a few. In retrospect, I see the tale as a tale of relationships with short shrift given to the worldbuilding. The only word I can think of to describe the book is dense. Part of this comes because I am a fantasy scifi reader with little interest in the relationship focus of this book. For me, I would have rather had more descriptions of the world built. It made suspension of disbelief more difficult than I liked. However, the book probably sings for romance readers. The interrelationships of the characters are dealt with in depth. Far too many people die for my taste—though there is little graphic violence. The overall negativity of the world presented continues throughout with little respite. This dystopian aspect interferes with the story—strange as that may sound. The resolution comes quickly—almost entirely in the epilogue. Morally, the end does not really bring satisfaction. But I was pleased that things were all resolved. Most of my vague discontent comes from the lack of spiritual reality. Part of that results from the lack of scripture in the lives of most. Biblical knowledge comes from the dim past. The story lies completely outside current prophetic reality about the Coming King. I found that disquieting. In addition, I desired a lot more spiritual content. The Christianity is religious with “the Lord works in mysterious ways” machinations. There’s no Jesus, no Holy Spirit, no spiritual enemy. The religion is strongly felt by the believers and has positive results, but the how and why are completely missing. The real problem probably lies within me. Many will enjoy the book. But, I’ve grown tired and bored by entertainment. I want meat—milk will not do. The political level probably requires adult knowledge and experience—though mature teens will enjoy it. I imagine many will enjoy the book a lot.